COULD the vitamin sourced from the sun help cure the disease caused by the sun? This is what University of the Sunshine Coast cancer prevention expert, Professor Michael Kimlin, will try and determine. Prof Kimlin will use a prestigious new $355,000 grant, sourced from the United States Department of Defense, to research the link between vitamin D and melanoma. 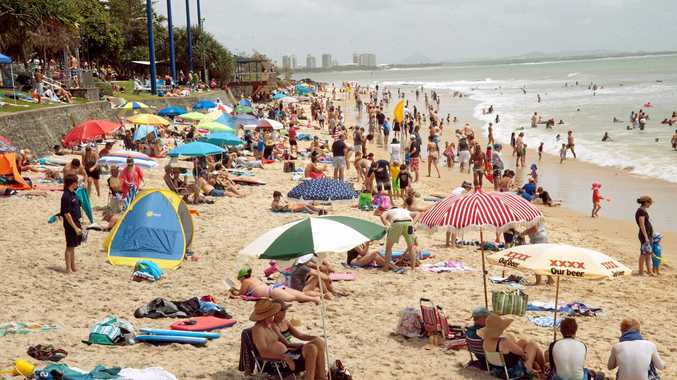 The sun is the main source of vitamin D.
Melanoma is a type of skin cancer that occurs from being overexposed to the sun and Queensland has the unenviable statistic of having the highest rate of melanomas in the world. Prof Kimlin said vitamin D might not be the cure to melanomas, "but it certainly may be a treatment option". "Melanoma is such an aggressive cancer, not one thing will cure it," he said. "But vitamin D is providing some intriguing clues in how it might play a role in melanomas." Research has shown "indoor workers have a higher risk of getting melanoma". "Why they have this may be because they lack Vitamin D," Prof Kimlin said. He will recruit between 600 and 700 Queensland melanoma patients for his study. "We will test if Vitamin D has a role in melanomas by looking at real people in the real world." But those hoping Prof Kimlin's theories might provide a good excuse to go sun bathing would be wrong. "We are not for one minute suggesting people should spend more time in the sun, they should spend less time," Prof Kimlin said. "Vitamin D is not only available through the sun. "You can get Vitamin D through tablets and intramuscular injections, which is possibly where we are heading. "In the future people may be able to take a pill to get the Vitamin D to protect themselves from melanomas." Doctors across the Sunshine Coast will be helping Prof Kimlin recruit the patients recently diagnosed with melanoma for the study. "Once enrolled in the study, participants will be interviewed about their sun exposure and cancer history, skin screening practices, general health and diet," he said. "They will be asked to provide a small blood and saliva sample for vitamin D-related genetic and biochemical analysis, and to allow access to clinical records for information about their melanoma tumour." To be eligible, patients must be aged between 18 and 79 and have newly-diagnosed melanomas, and their doctors need to be registered for the USC study. "Melanoma is the most rapidly rising cancer in the US military," he said. "They are granting schemes which are open to people all around the world. "The location of the study means we can recruit a lot of people. This study would take 10 years to do in America, it will take two here. "Professor Kimlin, who joined USC last year as its Foundation Chair in Cancer Prevention, is a world-leading researcher into the environmental factors that lead to cancer, particularly melanoma. He collaborates with Cancer Council Queensland.